Well, hi there! No, I didn't fall off the face the earth. I'm sorry for the longer than usual blog break. My nails are finally starting to grow long enough where I feel comfortable taking photos, and overall I just needed a little break. I'm off from work until Wednesday for Memorial Day, whoo! I have to work on some reviews to share with you guys. I will have the Zoya Island Fun, and Paradise Sun collection on the blog soon. I also have 6 new summer colors from SinfulColors to share with you as well. I will be super swatch busy this weekend! I'm also excited because I finally have my own nail space! :-) I've never shared any posts about where I do my nails, because well, it was my dining room table. My very cluttered dining room table, lol. :-p I've wanted a table/desk to do my nails at for awhile. 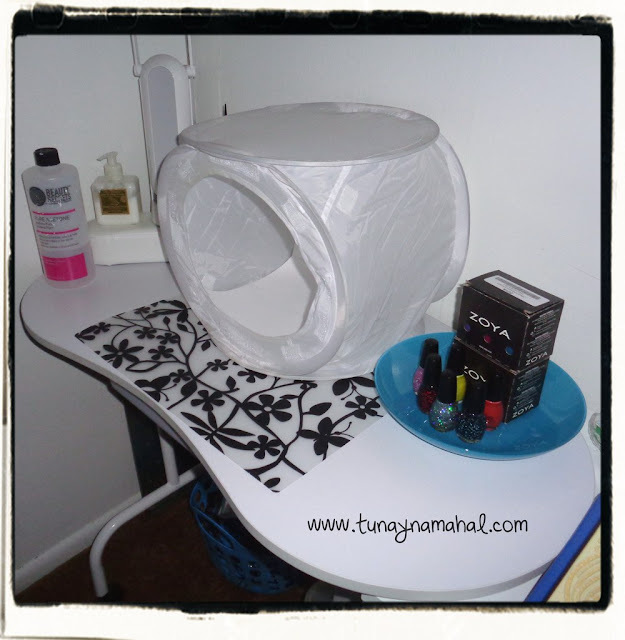 I've been eyeing this portable manicure table on Amazon for months. I watched the price drop from $100 down to $70, and I finally decided to order it. Free shipping! And- it arrived in 2 days! I set up my new space in the corner of our bedroom. My helmer fit perfectly beside it, the helmer is maybe inch to half an inch shorter than the table. 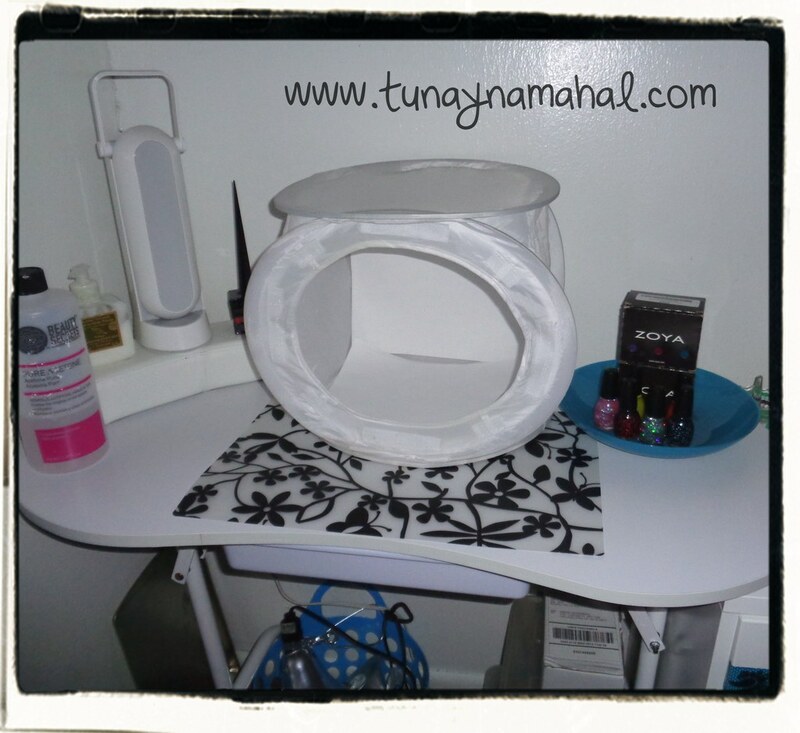 I store my light tent on top (or remove when I'm swatching), and underneath I have a basket for my clamp lamps, and boxes for other nail things. 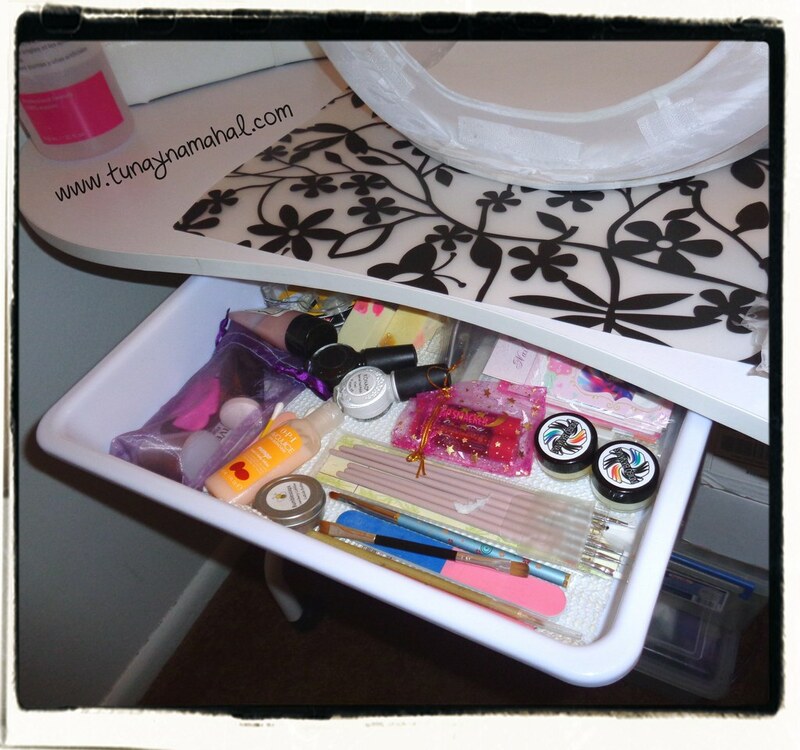 That mini cookie sheet there I use when I'm stamping, I put paper in it and stamp away while not worrying about making a huge mess. The best part about this table is there was absolutely no assembly required. I only had to take it out of the box, the storage bag, remove the foam and bubble wrap, and set it up. The table itself is sturdier and more well made then I expected. It has wheels so you can move it around, and it easily folds up to store again if you need too. It also has a small plastic drawer underneath that I am storing some nail necessities in. I ordered myself an upholstered folding chair to go along with my table, but that hasn't arrived yet. The chair I ordered also had free shipping. I may get a more comfortable chair eventually, but this was all I could afford right now. 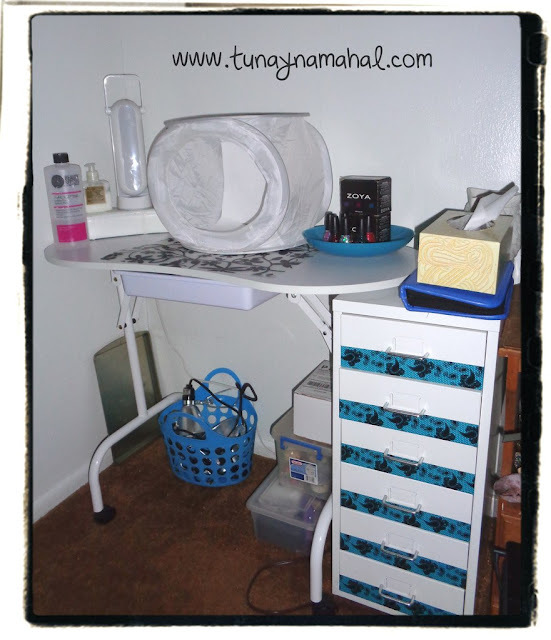 I'm super excited to finally have a permanent and functional place to do my nails, take swatch photos, or use my laptop to write blog posts. I'm also looking forward to getting back to blogging and sharing with you all again, I've definitely missed it. Have a great Memorial Day weekend!